Imagine a world without literature, where TV is responsible for the numbing of intellect and curiosity; where history is a thing of the past, and free-thought is prohibited. Imagine a world without books… a gloomy prospect, right? 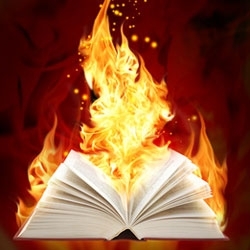 I'm not going into one about how e-readers are ruining our appreciation of the printed book – that's not what today's blog update is about – I'm talking about a dystopian future where books are burned. And if you're caught in possession of such illegal artifacts then your home is torched and you're arrested. Give me a book and I’m happy, turn on the TV and it has quite the opposite effect. My wife and I don’t own a licence, but we do have a TV and so watch what we want, when we want. We rent our movies from LoveFilm, and we’re happy to be entertained by various box-sets of seasons if we choose to buy them, and so committing just a short time to viewing – not taking up the whole evening, is my point, where we'd inevitably share conversation from the corner of our mouths, without once looking at each other. Both of us are keen-readers, always with a book to hand… I guess that’s why I’ve written one of my own (The Shadow Fabric). My dreams are often a place of dystopia, of an apocalyptic mess in which I find myself, rucksack in hand, wandering desolate wastelands, and battling adversaries such as winged-beasts and Sean Bean. All fuel for my fiction, certainly – and don’t ask me why I’ve often dreamed of Mr Bean… Wait, I meant Sean Bean, not Rowan Atkinson’s amusing character. Generally of speculative fiction, a dystopia is best described as a society characterised by misery, squalor, oppression and overcrowding; containing themes of social breakdown, political strangle-holds and environmental ruin. I bring this up because a few days ago I finished a novel, set it aside and thought, Wow, that was amazing. 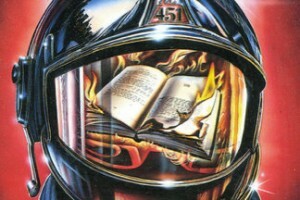 It was Ray Bradbury’s dystopian novel Fahrenheit 451 (the title, incidentally, means the temperature at which book-paper catches fire and burns). Published in 1953, the story portrays a future where ignorance has prevailed, where knowledge is forbidden… and where firemen do the exact opposite to which they do now: it is the fireman’s duty to burn knowledge – indeed, actually burn books – to promote ignorance, whereby equalising population and sustaining a social ‘sameness’. Yeah, messed up, certainly. Don’t worry, I’ll not reveal any spoilers if you wish to go out there and buy it, but let me give you an image: a TV room, and not one containing your 59 million-inch flat-screen with all your furniture pointed at it, but a room of screened walls, floor to ceiling of interactive monitors. Known as a parlour, this room entirely surrounds you in the soaps, the reality shows and shopping channels... and they talk to you, personally, by way of customer recognition. A room you'll never want to leave, a room far removed from the one featuring your modest book collection or indeed the traditional library. People find it odd that we don’t have a TV licence, often asking what we do instead… Really? I think, is it really that amazing I choose not to find friendship in the TV? Marilyn Manson once said ‘God is in the TV’, and I wonder if he has a point. On the other hand, think how many books have been adapted to television and how many authors' ideas would not have been transmitted to viewers without television. Besides, television has been around since the forties and book sales have increased. Has readers selection of books improved? That's subject to debate, but I'm not sure TV is (completely) to blame.